“Cavuto: Coast-to-Coast” panel discusses the new fallout from Amazon CEO Jeff Bezos blackmail and extortion claims. DUBAI (Reuters) - Saudi Arabia had "absolutely nothing to do" with the National Enquirer&apos;s reporting on an extramarital relationship involving Amazon.com Inc Chief Executive Jeff Bezos, the kingdom&apos;s minister of state for foreign affairs said. 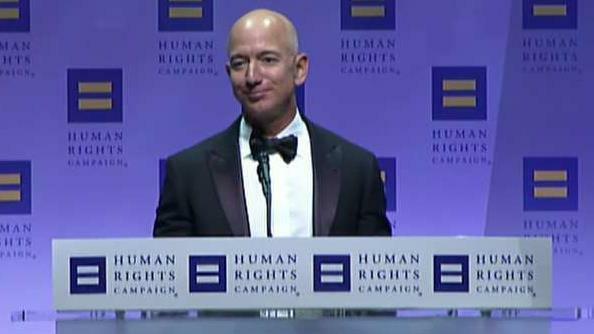 Bezos on Thursday accused American Media Inc (AMI), the Enquirer&apos;s owner, of trying to blackmail him with the threat of publishing "intimate photos" he allegedly sent to his girlfriend unless he said in public that the U.S. tabloid&apos;s reporting on him was not politically motivated. In a blog post, he alluded to Saudi Arabia&apos;s displeasure at the Bezos-owned Washington Post&apos;s coverage of the murder of its columnist and Saudi journalist Jamal Khashoggi. "This is something between the two parties, we have nothing to do with it," Adel al-Jubeir told CBS&apos; "Face the Nation" when asked if the Saudi government was involved in the Enquirer leaks. "It sounds to me like a soap opera," he said in an interview to be aired on Sunday, excerpts of which were posted on CBS&apos; website. Jubeir said he was not aware of any links between the Saudi government and AMI or its CEO David Pecker. The killing of Khashoggi at the kingdom&apos;s Istanbul consulate last October strained Saudi Arabia&apos;s ties with Western allies, exposed the kingdom to possible sanctions and tarnished the image of de facto ruler Crown Prince Mohammed bin Salman.